We present the system of customized hearing protection of the well-known Dutch company Alpine which is appreciated throughout Europe for its innovative and uncompromising approach to the problem of hearing protection. Our offer includes both customized hearing protectors with Alpine filters and individual earplugs. Customized hearing protectors are the most modern solution to hearing protection in the workplace. They minimizes the effects of dangerous noise on the human body. Their innovativeness lies not only in the way of sound wave attenuation, but above all in individual adjustment to the anatomical structure of each worker’s ear. Individual hearing protectors are equipped with acoustic filters to reduce noise, while speech and alert signals remain audible. Due to the small dimension they are comfortable to use and esthetic. Alpine produces five variations of filters offering different levels of attenuation of harmful sound waves. All Alpine filters work in an open system what ensures proper ear ventilation, does not cause squeeze and allows to identify proper direction of speech. Our hearing protectors meet all health and safety standards, both Polish PN-EN 352-2 and European DIN EN 352-2E. 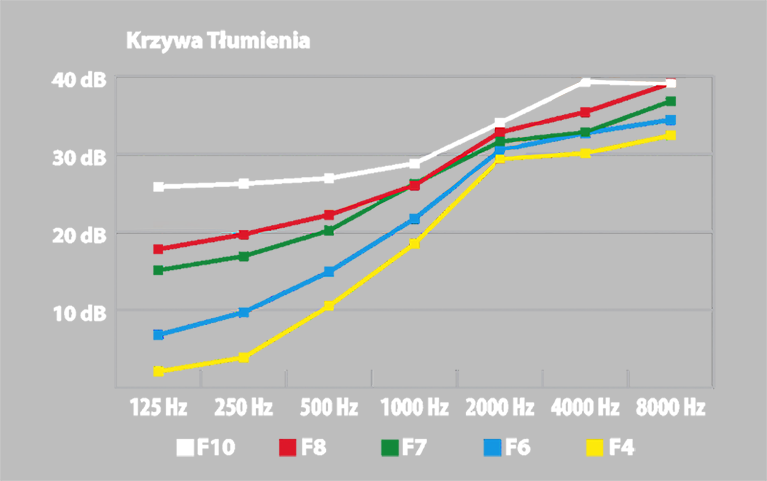 The graph shows the attenuation curves for individual filters used in the Alpine hearing protection system.